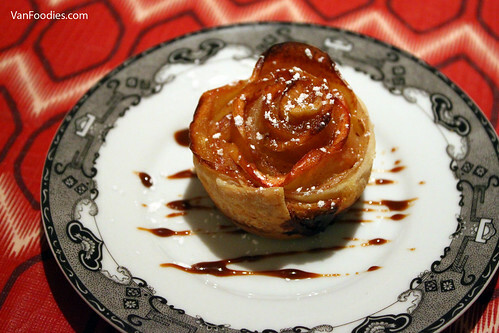 In an earlier post, I mentioned that we made some apple roses for our thanksgiving dinner. It was quite easy to make, and I think it’s a very romantic finish to any dinner with your loved ones. The recipe is originated from this YouTube video by Cooking with Manuela. We made some adjustments because 1) we didn’t think it would be sweet enough and 2) we made extra jam mixture to add more moisture to this, so our recipe here is slightly different. 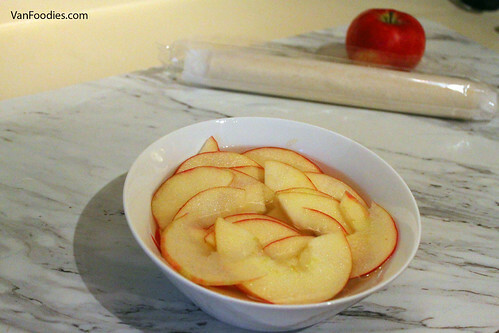 In a microwave-friendly bowl, add lemon juice and apple slices. Fill it with water so the water level is just covering the apple slices. Microwave for about 3 minutes until the apple slices are soft and pliable. Drain the water. In another microwave-friendly bowl, mix the peach jelly (any stone fruit jam would work in this case, i.e. apricot, peach, apple, or even fig) with equal part of water. Microwave for 1 minute until it’s mixed well together. Sprinkle some flour on your counter, roll out the thawed frozen puff pastry (available at most grocery stores; takes 24 hours to thaw in the fridge, or 2 hours in room temperature). Carefully stretch it so you can cut it into six 2-inch strips. 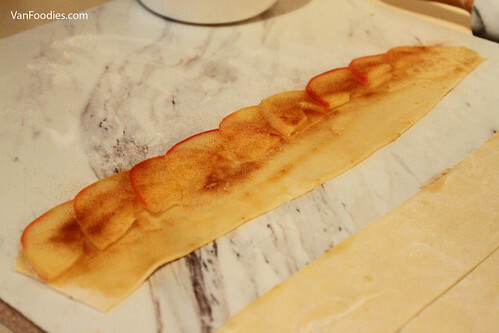 Spread the jelly mixture on the puff pastry, and place the apple slices in a way that the curved end would stick out of the puff pastry. Mix the cinnamon with the granulated sugar. Sprinkle the mixture on top of the apple slices. 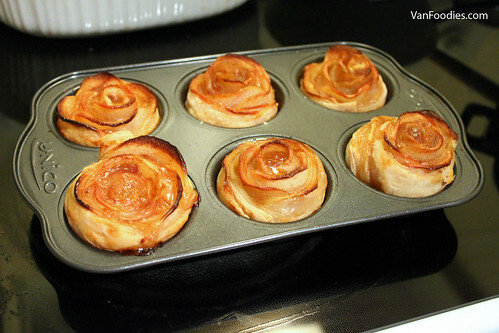 Fold the puff pastry in half, and roll it. 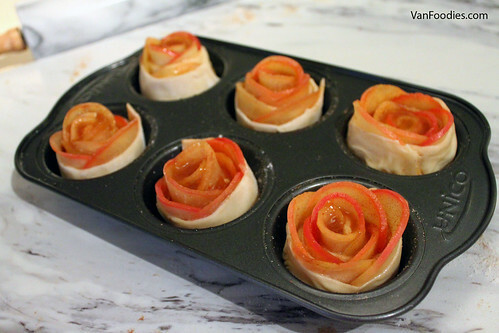 Bake the apple roses for 30 minutes in the centre of the oven. Then move the pan to a lower rack and bake for another 10-15 minutes until the pastry is fully cooked while not burning the apple slices. In the video, it suggests to sprinkle some powder sugar for decorations. We took it further by drizzling some OMG Vanilla Cajeta. Mr. went as far as adding a scoop of salted caramel ice cream to his plate. It was just our first attempt and it turned out very well. 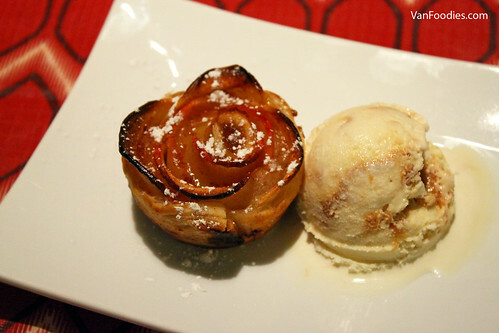 Our guests were impressed, and felt that this is like an elevated version of an apple pie. So true! I hope this will make it on the menu of your next romantic dinner at home. So pretty and I bet they taste just as delicious!